YEA! I get to go home. Homecoming is always sweet, no matter how long the absence. Don't you feel that way? Wayne and I discovered our float cabin by chance in 2001 and haven't wanted to be anywhere else. We left from the South Terminal at Vancouver Airport on a Pacific Coastal flight to Powell River. 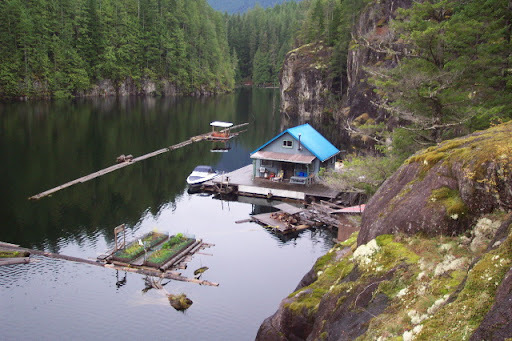 From there it's only a 25 minute flight up the Sunshine Coast, a fifteen minute drive to the Shinglemill Marina, and a 25 minute boat ride up Powell Lake to our cabin home in Hole in the Wall. What will I find? I know my floating vegetable garden needs some attention. During my last trip in late March I got all my planting done. I was worried about getting my hand dirty after surgery. I hope my new strawberries have taken hold. Is the unknown critter that's been digging up my flower pots still be hanging around? I sure hope he (or she) hasn't made it out to the floating garden! What will I find? Actually, it doesn’t matter. I'll find the best place in the whole world. 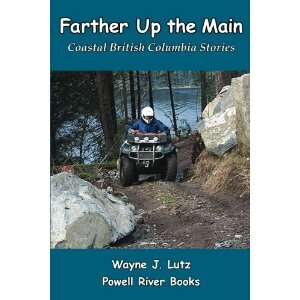 Our cabin on Powell Lake inspired my husband Wayne to write the Coastal BC Stories series. You too can head Up the Lake and Farther Up the Lake through his books. The Texada Island Ferry patiently waits offshore each evening for the Comox Ferry to return to Powell River from Vancouver Island. 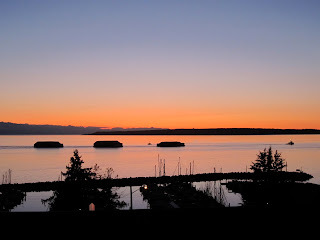 This time of year it's just after sunset when the sky has a warm glow and the water turns a luxurious iridescent blue. I just can't get no "Relief." I just couldn't pass up the play on words from the Queen song Somebody to Love. When I was on Granville Island, I spent a lot of time walking around. When I got to the base of the bridge, I was surprised to see a boat hanging from the underside. She is the Relief of Prince Rupert. There is more information about her at the website Wooden Boats of the North Coast. The Relief was built in 1929 by McLean's Shipyard in Seal Cove, Prince Rupert, as a 50-foot halibut fishing boat for Captain Merrill Sollows. After a stint as a rum runner, she was a very productive troller. But like many other wooden ships, Relief ended up needing too much work to make her seaworthy. The Sandbar Restaurant bought and mounted her outside to enhance the view for diners. 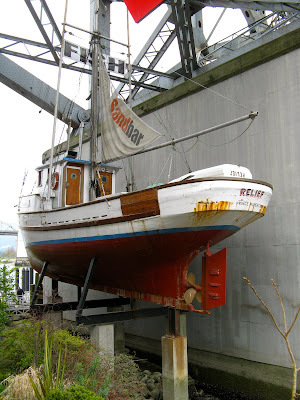 On my second trip to Granville Island to hear Lloyd Kahn speak about his Tiny Homes book, I ate at the Sandbar. The Relief kept me company through a tasty dinner and local Granville Island brew. The Steveston Harbour was and is a working harbour managed by the Steveston Harbour Authority. The Gulf of Georgia Cannery and the 100 year old Canada Fishing Company (Canfisco) is now a national historic site with excellent tours and displays. Steveston Harbour is home to the largest fishing fleet in Canada. And lucky for us, there's a large Fish Sales Float were you can purchase just caught salmon, shrimp, and other wonderful seafood delights right off the fishing boats. In addition to fishing boats, large tugs pull barges with heavy loads up and down the neighbouring Fraser River. The easiest way to get to downtown Vancouver BC from the south is by bridge across False Creek, a short, narrow inlet off the Strait of Georgia. 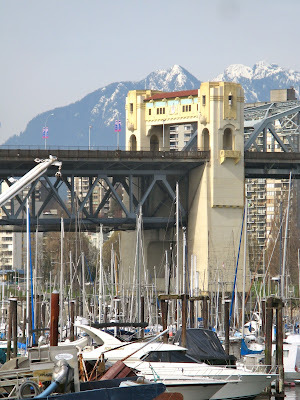 There are three to choose from, but the Burrard Bridge is the most unique. The Burrard Bridge is a steel truss Art Deco structure designed by George Lister Thornton Sharp and erected in 1932 under the direction of engineer John R. Grant. The two massive concrete pylons have intricate architectural details. Their purpose is to hide the massive steel bridge supports in an aesthetically pleasing manner. You don't see new bridges do that as much these days. This duck did a running start to get airborne, leaving a splashy trail behind. Another visit to Granville Island. This time to take a look at one of the many Aquabus water taxis that you see scurrying up and down False Creek. My room at the Granville Island Hotel overlooked the Aquabus dock. What a great place to stay and enjoy all that the island has to offer. Aquabuses serve docks up and down False Creek taking passengers and bicycles back and forth from eight different stations for a reasonable price. As Henry Wadsworth Longfellow so eloquently said, "Into each life some rain must fall. " This lovely lass wasn't afraid of the misty midday on the Steveston BC docks. Today I'm taking a mini-vacation to one of my favourite lower mainland towns, Steveston BC. I had the opportunity to meet fellow blogger Rhianna. 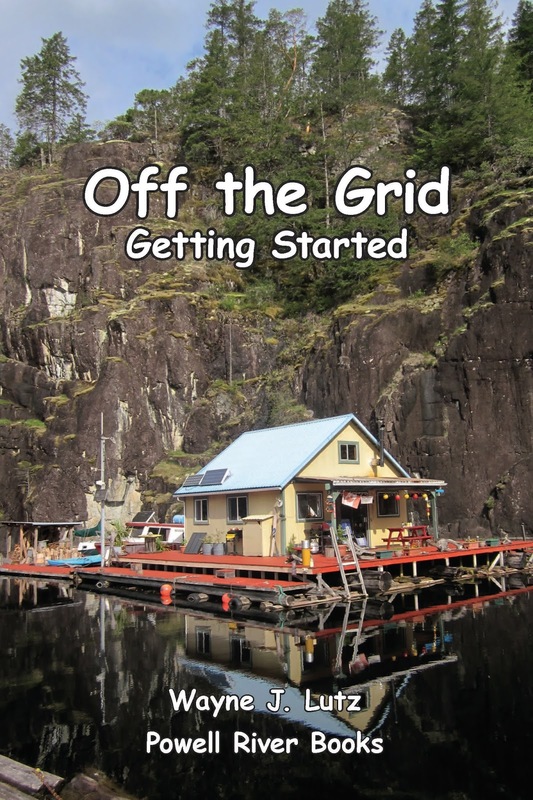 She writes about her float home in a blog called The Eclectic Arc. She's also a massage therapist here in Steveston. As we walked around, I noticed several murals adorning the sides and backs of buildings in this quaint town. This large mural features Orcas that frequent the Strait of Georgia. 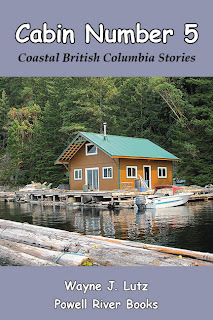 Lloyd Kahn is on a BC book tour for Tiny Homes: Simple Shelter. His first stop will be Emily Carr University on Granville Island in Vancouver BC. Here's more information from their website. 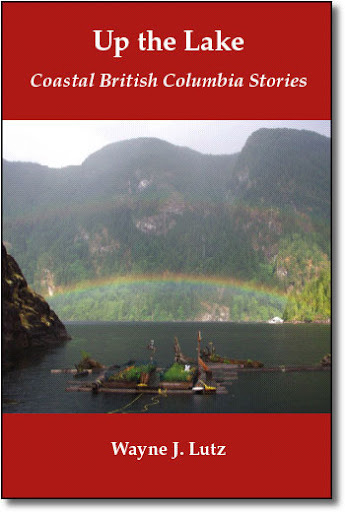 The presentation is in partnership with Banyen Books & Sound of Vancouver. 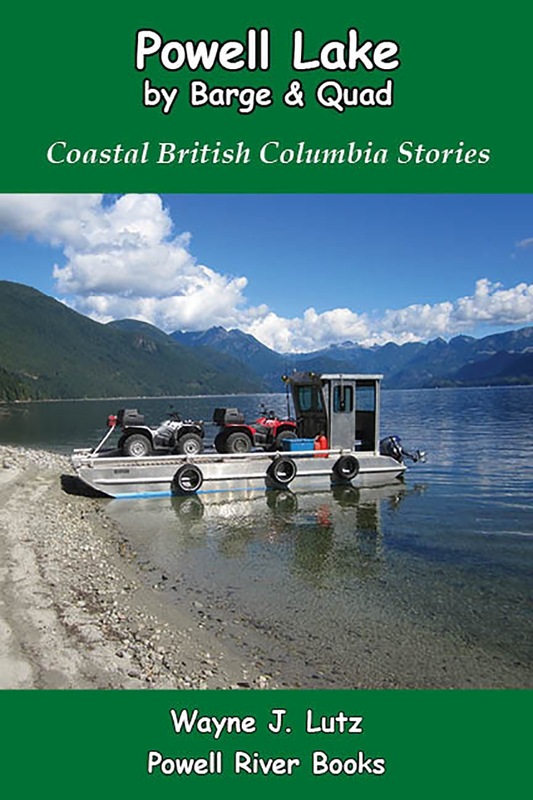 Lloyd will be on Hornby Island on April 22, Denman Island on April 23, and in Victoria on April 25 at 7:00 pm, University of Victoria, David Lam Auditorium in the MacLaurin Building. Check his blog for details. And check out pages 210-211 for Our Little Cabin up the Lake. Quite an honour for our little place in Powell River, BC. Today's bridge post is a three-fer. This week I took a mini-vacation to Granville Island in Vancouver BC. It's a great destination tucked underneath the Granville Street Bridge. You have to weave around a bit on back streets to get under the bridge pillars, but the effort is well worth it. The island has shops, restaurants, parks, a waterfront hotel, the Emily Carr University of Art and Design, a huge indoor Public Market, and is home to Granville Island Brewing. To the west of Granville Island is classic Burrard Street Bridge spanning False Creek. There's nothing like a farmer's market, and Granville Island has a wonderful one. It's indoors and has lots of booths to choose from for flowers, vegetable, baked goods, coffee and tea, meats, and delis. There are also great places to get a quick late breakfast, lunch, or early dinner. Market hours are 9:00 am to 7:00 pm. 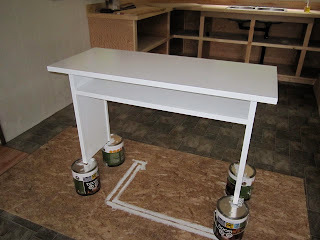 Rather than buy a lunch, I decided to build my own by shopping. I got a glass of fresh squeezed organic grapefruit juice from Fraser Valley Juice & Salad, a fresh sesame bagel from Siegel's Bagels, and a slice of organic BC Alpindon cow's milk cheese from Benton Brothers Fine Cheeses. I took my booty outdoors and found a bench overlooking the water. What a great meal. This large 7-ton crane from Granville Island's working days in now on display on the northeast end of the island. It was originally built in the 1920s to serve the industries on the island that used the waters of False Creek to transport their goods. It's no longer operational, but is an impressive display next to the Emily Carr University of Art and Design. I just got back from Granville Island in Vancouver BC. It's only about an hour and a half drive north of Bellingham, perfect for a quick getaway. Granville Island started as a sand bar in the inlet called False Creek. In fact, Granville used to be the name used for Vancouver until it was changed in 1886. Granville was kept as the name for the street and bridge leading into town. Now tucked under the bridge, where once industries thrived, the redeveloped area now draws locals and tourists alike. Granville Island (now actually a peninsula with a narrow link to shore) is surrounded by marinas. Boats large and small are moored here waiting their turn to head out into the Strait of Georgia for a cruise. One classic wooden yacht moored here is the M.V. Meander. She's an ocean-going vessel originally built in 1934 for George Kidd Esq. who owned the Vancouver Power Company and was head of the Board of Trade. She served in WWII as a gunship, then a missionary vessel serving Vancouver Island, and a Greenpeace blockader. For months I've been shopping for a table to put next to our sofa at the cabin. For years, we've used two oak TV trays. They have served us well, but the legs did get in the way while storing things underneath, and the surface was barely large enough to hold all the stuff we liked to have at our fingertips. I looked in Powell River, Bellingham, and online. Small desks were too wide. Sofa tables were too long. And both were so heavy. Sometimes when I have a hard time sleeping, I design things in my head. Three years ago I drew a diagram of what I thought would be a perfect solution. I went back in my diary, found the illustration, made a few adjustments after talking to Wayne, and gave it to John. John is great about taking my designs and modifying them to make them even better. My only mandatory requirements were solid side panels to hide our charging station, a lower shelf to give us more surface area, and the overall dimensions. As you can see, John made us the perfect sofa table. We get some really spectacular sunsets here in Powell River, BC. Looking across the Strait of Georgia I saw this sundog. From the marina I could only get one half in the viewfinder. I went up to the condo balcony and was able to capture both sides. The left was definitely more distinct than the right. Squalicum Harbor has been under construction for several months. One day, Wayne and I went to the fuel dock and saw this big tug moving a work barge. The Island Chief is pretty unique. A crows nest is something I haven't seen before on a tug. The Island Chief is owned by the Island Tug & Barge Company of Seattle, Washington. It was built in 1963 by Luby J. Guidry with a length of 21.64 metres. It works as a pusher rather than a puller tug, so I guess the high perch allows the captain to see forward over the load. About two-thirds of the way from Spokane to Pullman on Highway 195 is the small town of Colfax, Washington. Colfax, founded in 1873, is the seat of Whitman County. It's also the heart of the wheat producing lands of eastern Washington. Highway 195 goes right through downtown. I just love the ad on the wall for "Rip-Proof Overalls." Just the thing to wear out in the barn. Maybe the owner of this beautiful red barn wears some.